Adventures in Hectic Eclectic: Do Buddhists Believe in God? Most often, when people ask me this question, they are referring to the god of the Abrahamic traditions of Judaism, Christianity and Islam. The short answer to this is no, they don't. By its design, Buddhism is a non-theistic spiritual practice. In fact, one doesn't have to follow the religion of Buddhism in order to adopt its philosophy in daily life. However, having said that, Shakyamuni Buddha was silent on the topic of belief in gods. There are Buddhists who do venerate deities, a list of some of these can be found here. A Hindu friend once pointed out that some Hindus see the Buddha as an incarnation of the god Krishna. There are those of other faiths who view the Buddha's teachings as philosophical principles that slot in with their religion and enhance their spiritual experience. (I know one Christian and three pagans who have incorporated Buddhist teachings into their own faiths). Essentially, you don't have to be a Buddhist to adopt the Buddhist prinicples and you don't have to discard the god idea to be a Buddhist. What it boils down to, at the end of the day, is the personal philosophy and interpretation of the individual Buddhist. Some believe in gods, others don't. I am of the belief that being atheist or agnostic does not make a person 'evil' or incapable of telling right from wrong, or removes from them the ability to live a moral life. Do I, personally believe in god? Not in the Abrahamic sense, no. My personal belief is that we are all born of a single divine source, to which we return. We are not separate from this source, neither are we separate from each other. We are one. Each of us is a part of a much greater whole. We are connected to each other just as the limbs and fingers and organs are connected to our own bodies. We may see these things as separate, but they all make up one whole. Do Buddhists Worship The Buddha as Their God? Buddha was a man. He was born Siddharta Gautama, left his life of wealth and opulance and achieved enlightenment. From then on he was known as The Buddha, or Shakyamuni Buddha and he began to teach. He was born. He lived. He taught. He died. He was not a supernatural being - he was human. 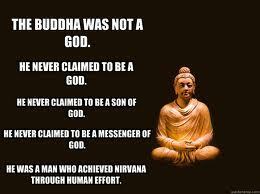 Buddhists honour and venerate the Buddha and his teachings, but he is not a god. Some Buddhists feel they should keep a shrine or a statue of the Buddha in their homes to show respect to the Buddha and the path he introduced to the world. No doubt there are those Buddhists who do see him as a divine being and wish to dedicate offerings to him. However, the Buddha himself did not wish to be raised high as a god or divine teacher. All he wished to do was impart what he had learned to help alleviate the suffering of others. Are those Buddhists who elevate Buddha to god status wrong? No. Are those who do not elevate the Buddha wrong? No. It boils down to an individual choice. I personally have a statue of Buddha as well as a painted likeness of his face in my home. 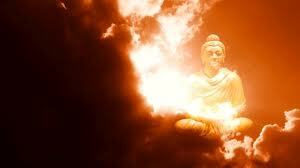 I do not view Buddha as a god, however, I choose to see him as a teacher whom I love. I have his likeness in my home as a reminder of his teachings and what I am striving to create in my life each day. If You Don't Believe In God, How Can You Be Saved From Sin? The concept of another making a blood sacrifice for the redemption of others is, again, an Abrahamic concept. In Judaism, Islam and Christianity, the idea of atonement by blood sacrifice exists. Abraham was asked to sacrifice his son, but later substituted a lamb for the offering. Doves and lambs were used in the Judaic traditions and, the most famous blood sacrifice appears in the Christian tradition with Jesus being crucified. In Buddhism, it is up to the individual to take responsiblity for his own life and therefore his own 'salvation'. The concept of Karma aids in this. Every action we perform creates a cause. This cause is either helpful or unhelpful. I have written more about Karma here. Buddhists are encouraged to create helpful causes. In taking responsibility for our own lives, we cannot rely on others to 'save' us from ourselves or from the unhelpful causes we have created. We can only create better causes for ourselves and our lives.